Linda Sewell joined Coca-Cola Bottling Company UNITED in 2016 as Director of Community Relations & Communications. In her role, she is responsible for developing and maintaining relationships with key stakeholders and community organizations; developing and executing charitable contributions strategies; and managing internal and external communications. Linda is a veteran in the field of community relations, corporate communications and working with global brands. She was with Mercedes-Benz for more than 25 years and was part of the site-selection and leadership team that chose Alabama as the site of the company’s first manufacturing location outside of Germany. As a part of the company’s initial leadership team, she helped establish the new company in the U.S., including building relationships in the community, creating the company’s charitable giving strategy and launching the first Mercedes sport utility vehicle to the worldwide media. 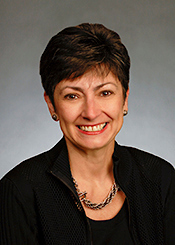 Prior to joining Coca-Cola, Linda was Vice President of External Affairs for Energen Corporation, a publically-held oil company based in Alabama. In this role, she was head of the company’s charitable Foundation and Political Action Committee, along with managing its strategic planning activities. Linda’s civic and community involvement has included serving on the executive committees of Heart Gallery Alabama and Red Mountain Theatre Company. In addition, she is on the Board of Visitors for the University of Alabama’s College of Communications. She has also served on the boards of many other civic and nonprofit organizations throughout Alabama, including McWane Science Center, Kid One Transport System, Aldridge Gardens, Birmingham and Tuscaloosa Chambers of Commerce, Business Council of Alabama. A native of New York City, she has a B.A. in Communications/Journalism from St. John Fisher College in Rochester, NY, and an M.B.A. in Marketing from Pace University in NY. Linda and her husband Steve have two girls, Ana and Abby, ages 14 and 11. They are members of Prince of Peace Catholic Church in Hoover, AL.